Kuala Lumpur, the capital city of Malaysia, is home to impressive skyscrapers the most famous of which has to be the Petronas Towers. Along with the gleaming towers of glass and steel are endless cranes that seem to be competing to see who can reach higher. As one of the most developed countries in Southeast Asia, Malaysia is a magnet for migrant workers from its neighboring countries including Indonesia, Bangladesh and Nepal. From nannies to security guards and construction workers, estimates place migrant workers in Malaysia as over a third of the country’s 14 million workers. Taking on dirty and dangerous jobs that Malaysians do not want, this scathing review of migrant workers by Joshua Woo highlights the fact that even with the best laws to protect migrant workers, weak enforcement in the past has created a negative reputation for Malaysia. A report on migrant workers by Al Jazeera shows just how vulnerable these migrant workers can be to abuse. Even as the new government grapples with the complex issues surrounding migrant workers, it is clear that Malaysia will need migrant workers just as much as these workers need jobs in Malaysia. The challenges to creating safe and fair working conditions are enormous but not insurmountable. Enforcement operations to nab illegal workers will initiate change including the weeding out of unscrupulous hiring agencies but longer term solutions are needed to meet the needs of the country and its migrant workers in order to prevent disruptions like the recent ban imposed by Nepal. With land borders shared with Indonesia and Thailand, undocumented or illegal workers in Malaysia will continue to be a problem. Sabah state alone, is reported to have 800,000 illegal persons most of which can enter the state illegally with a short boat ride from the Philippines. Solutions including the licensing of illegal workers and giving refugees the right to work are viable but face protests from the local populace who blame low minimum wages on the foreign workers willingness to work for low pay. As the government works towards its election pledge of raising minimum monthly wage to 1500 MYR (USD375) from the current 1000 MYR, the plantation and construction sectors have declared their support. Minimum wage however, is not the main challenge especially for the palm oil sector. As one of the key industries, the ability of the palm oil sector in Malaysia to benefit workers from less developed countries has been overshadowed by instances of labor abuse. A detailed response by the government was filed publicly in 2012 and went to great lengths to detail all the actions being undertaken to provide fair working environments for workers in Malaysia. A follow up action is currently being undertaken to remove the country from being listed on the United States Labour Department’s List of Goods Produced by Child or Forced Labor. This would be a major score for the industry in Malaysia which has plans to export more palm oil to the European Union under the Malaysian Sustainable Palm Oil (MSPO) scheme. The biggest challenge for the palm oil industry in Malaysia is not fair labor but the shortage of workers. As testimony to the industry’s ability to create jobs, Indonesian migrant workers which at one time formed the bulk of plantation workers in Malaysia are choosing to work those same jobs in Indonesia as the country’s plantations expanded in the last few years. Those that have chosen to work in Malaysia have shown that strong incentives are needed in order to get them to work there. From recent interviews with migrant workers in Sarawak and Peninsular Malaysia, high wages was identified as the key incentive. The east Malaysian state of Sarawak was once a preferred destination for Indonesian migrant workers. With a long porous border shared with Indonesian Borneo, easy access into Sarawak has not meant an abundance of migrant workers. 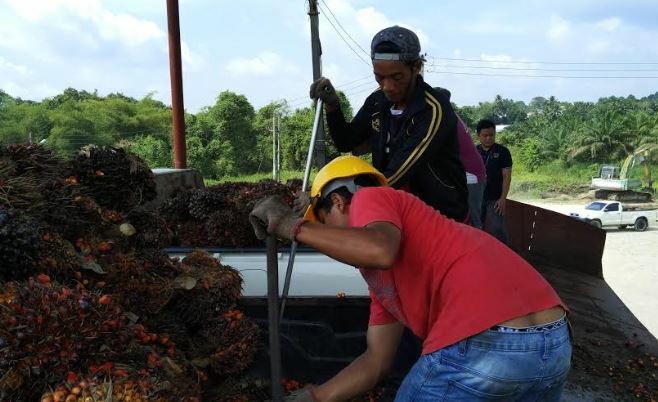 Restricting factors of their numbers are the demands of the workers and strict regulations imposed on their hire by the Malaysian Palm Oil Board. This has led to a labor shortage where good workers are in high demand. At Sarawak Oil Palm Bhd’s Tinbarap collection centre, the receiving team for Fresh Fruit Bunches was exclusively Indonesian. Their average take home salary is equivalent to USD400 per month. With company provided housing, the workers were able to remit an average of USD265 per month to their families in Indonesia which according to them, was enough for a decent living and some savings. Elsewhere at its Lambir Hills estate, the company has created a “home atmosphere” for its Indonesian workers by providing free schooling using current Indonesian curriculum for the children of their workers. A most interesting situation was the migrant workers who have created a unique supply-demand situation to service the labor needs of small farmers in Sarawak. Where an individual small farmer may not have enough work to keep workers full time, these migrant workers maintain a few small farms which benefits both the workers and the small farmers. In a different meeting with workers in a Sime Darby plantation in West Malaysia, a coffee shop setting was provided where the only formality was to have the workers confirm that they were there of their own free will and spoke without training or coercion by the company. This group of workers identified themselves as having come from India, Bangladesh and Indonesia. The overwhelming conclusion was that they were there because work in a palm oil plantation in West Malaysia paid better than any work opportunities in their home countries. An average take home wage of USD500 was reported by the group which included both skilled mill workers and plantation workers. Monthly remittances to their families averaged USD350 which is made possible with the free housing and food subsidies they receive. After factoring in the free housing plus food and phone (to keep constant contact with families) subsidies, the overall earnings of these workers are much higher than the new minimum wage being implemented. All of them responded that their physical separation from wives and children was hard emotionally but their ability to provide better livelihoods for their families back home was worth the sacrifice. With the exception of a Mr. Suyanto from East Timur who has gained Permanent Resident status, the majority concluded that working in Malaysia was a short term plan to save enough money that they can step up in society once they return home for good. It is most likely the success stories of these migrant workers that inspires their countrymen to follow in their footsteps, even to the extent of borrowing money to pay for a chance at it. Protecting the rights of workers in the palm oil sector is expected to be enhanced by the MSPO scheme which is being implemented across the country. Forced or trafficked labor is prohibited as according to national laws but where workers stand to gain the most from the MSPO is the right to create or join unions and collective bargaining agreements. Where enforcement may have been slack due to the sheer number of migrant workers, the case-by-case audits that are done as part of certification will serve to protect the rights of these migrant workers who look towards Malaysia as an opportunity to better their own futures. The ability of the palm oil industry to benefit not just the people of the home country but those of migrant workers must be calculated into the sustainability of the industry.